I’m pleased to announce that the first Affrus 2.0 Alpha build is ready for testing. 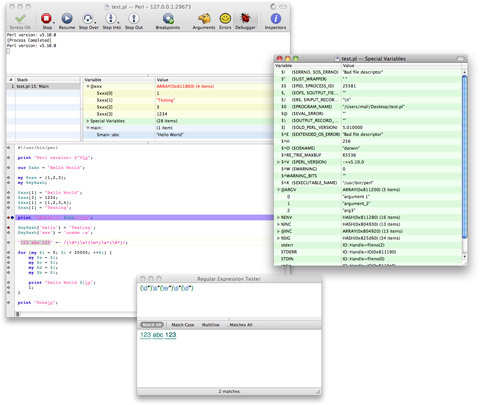 For those unfamiliar with this software, Affrus 2.0 is an editing and debugging environment that makes Perl and Ruby script development productive by keeping things simple. In recognition of your patience and invaluable input, Affrus 2.0 Alpha builds are initially available only to our existing Affrus 1.0 customers. In order to join the Affrus 2.0 testing program you will need an Affrus 1.0 registration number and a Macintosh that runs Mac OS X 10.6 or later. Affrus 2.0 presently supports Perl versions 5.8.9 and 5.10.0, as shipped by Apple with Mac OS X 10.6. To join the Affrus 2.0 testing program, send your request, along with your Affrus 1.0 registration number, to support@latenightsw.com. Keep in mind that this is an Alpha build so while it’s certainly functional, it’s not complete. Expect bugs and missing features. I ask that you decide if you can cope with the inevitable inconveniences that using an Alpha build presents before you download it. You may also notice that certain Affrus 1.0 features are missing. This is temporary. Missing features will be added back as I work towards a Beta version of Affrus 2.0. In exchange for this inconvenience, you get a chance to influence Affrus 2.0 as it nears completion. I really appreciate the support you’ve all shown during the development of this new version of Affrus. I’ve always been focused on the needs of my fellow developers and strive to make the best tools possible. I believe that Affrus 2.0, when complete, will not disappoint. Now I’m getting excited! I’ve been waiting for this for a long time.